Sokojikara Silk Wrapped Bamboo Blossom Katana Sword | BUDK.com - Knives & Swords At The Lowest Prices! Unleash your inner Samurai Warrior with this Sokojikara katana sword! It features a 28 7/10" 1045 carbon steel blade that has been hand-forged and is a hefty 7mm thick. The cast tsuba offers an ornately detailed bamboo blossom design and the genuine ray skin handle features heavy silk wrappings. A brown lacquered scabbard with an inlaid bamboo blossom design in genuine mother of pearl completes the elegant look and feel of this sword. Includes a satin sword bag and a cleaning kit. I bought this sword for my girlfriend and she absolutely loves it! 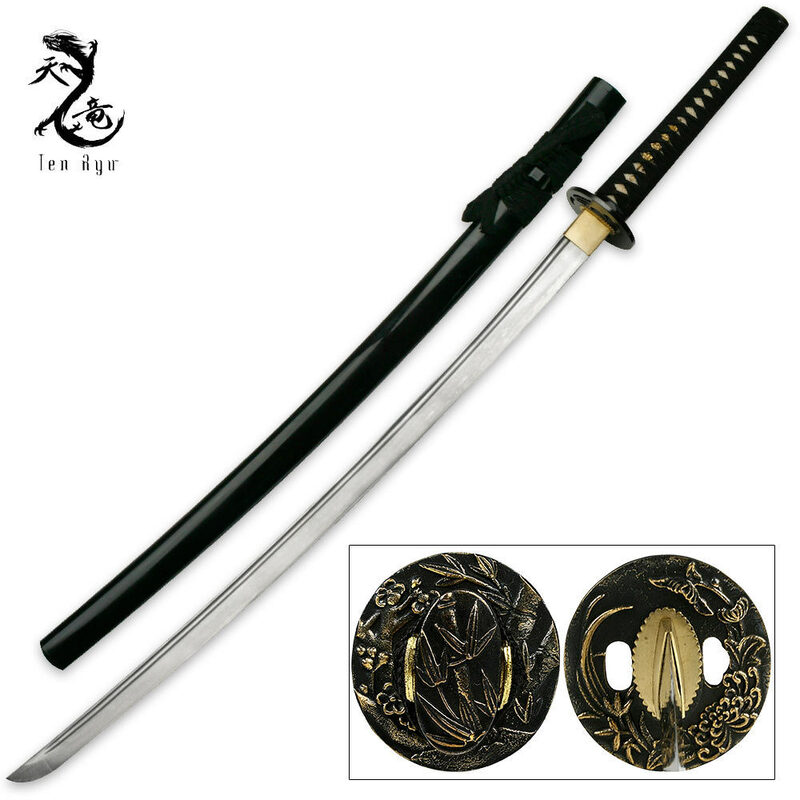 The blossom pattern on the scabbard is absolutely exquisite, and the blade is beautiful and came razor sharp. It's high end as far as machine made blades go, and an excellent deal for the price. There are a few minor flaws with the lace around the handle not quite covering the rivets, but that is to be expected from machine quality swords. This is one of the best deals you'll find for the price. If you're super picky about technicalities and minor flaws, go to Japan yourself and spend $10,000 on a custom made flawless sword, you won't find it here. Very happy with this sword. Awesome and function decorative peice! This sword is not only shaving sharp out of the box, it's gorgeous. It makes a great display peice for the man cave. @Alexander no where does it say this sword came from japan. it only says its a japanese style katana. giving 2 stars because you misread something is sad. 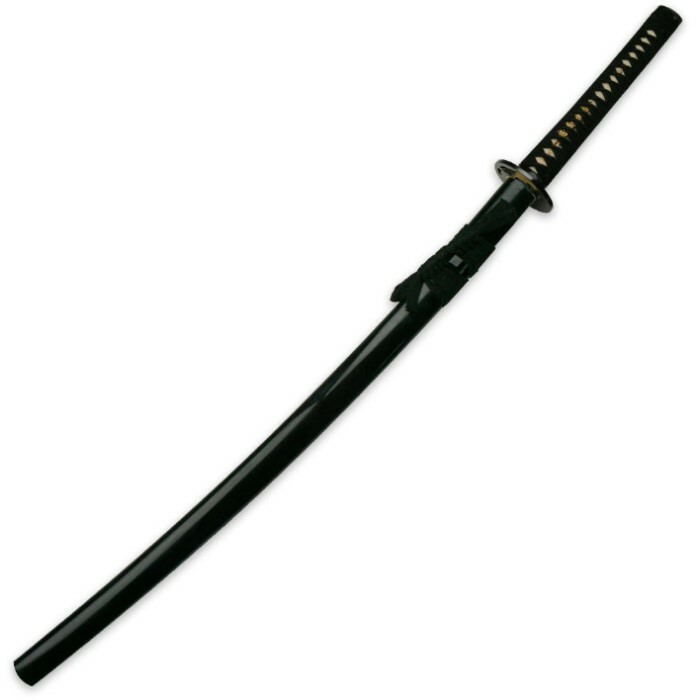 This piece is beautiful, it is very well made and feels very secure in the scabbard without being hard to pull, this is also very well balanced unlike other katanas which can feel heavier at the top. the artwork is fantastic and everything about this sword is high quality. You know I have to admit as beautiful as these hand forged blades are it sad that none of then actually came from Japan.